There are ads for a single brand of dehydrator scattered throughout. I actually wouldn't have minded seeing her reviews of several different brands, but this felt more like product placement. She's a big fan of using sulfur to treat your fruit before dehydrating it and barely touches on alternative methods of pretreating. 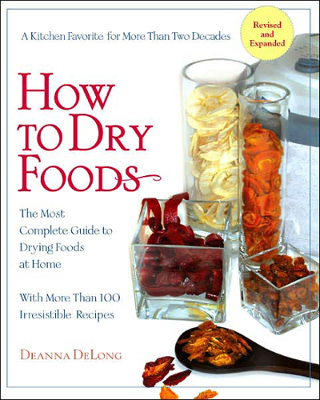 Some folks recommend Making & Using Dried Foods by Phyllis Hobson as a more well-rounded alternative in that department, although I haven't read it yet. That said, I'm a big fan of charts that sum up lots of information in a small space, and DeLong's charts are probably worth the entire price of the book. I actually bought an e-copy to have on hand as I experiment with drying this summer, and I tend to only buy a few books per year, so, yes, I recommend it. Weekend Homesteader walks you through fun and easy projects to get started on the path to self-sufficiency. Excalibur food drier has a decent book that comes with your purchase. You never need to sulfur anything. It used to be an alternative to drying. I'm looking forward to reading their book when the dehydrator finally arrives! Sulfur is a pretreatment more than an alternative to drying. The point is to do what blanching does when you're freezing --- stop enzymes that will otherwise keep slowly breaking down the flavor and nutritional value of your food even though it is preserved and won't spoil. That said, lemon juice seems to be a good alternative (although probably only about half as effective), and you can also use powdered up vitamin C pills in water.